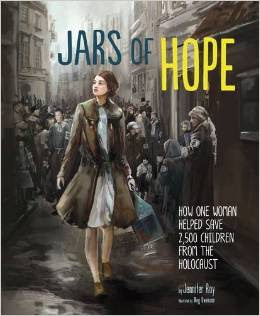 In her book, Jars of Hope, Jennifer Roy takes the reader back to the childhood of Irena Sendler to understand why she would be willing to risk her own life years later to help the Jewish children in the Warsaw Ghetto after the Nazis so many people into such a small, unsanitary living space. As a child, in her hometown of Otwock, Poland, Irena saw how the Jewish people were avoided, but her father taught her that nothing else matters about people except whether they are good or bad. Irena grew up to become a social worker/nurse and as she watched events unfold in Warsaw after the Nazis took over, she was compelled to do something - but what could one person do, she asked herself. The answer was to try and bring food and medicine to the people in the ghetto, but more importantly, Irena began to sneak the children out and to find safe homes for them until the Holocaust ended and they could be reunited with their families. Irena began to organize friends and other trustworthy people in the Polish underground who could help her carry out her frequent trips to get babies and children. Babies were taken out in carpenter's boxes, trash or coffins after being given a few drops of medicine to make them sleep. Older children were smuggled out different ways, sometimes through sewer tunnels and other times right under the noses of the Nazi guards. Teaching the children what they needed to know in order to pass as Catholics, Irena would write down each child's original name, new name and where each was sent. Then she would put the names into jars and bury the jars under a tree. Irena and her helpers would continue to make sure each rescued child was cared for, and the families or convents were given food and money in return for the risk they were taking. In 1943, Irena was arrested, taken to prison and tortured, but never revealed the names of rescued children, where they were hidden or who had helped her. A few months later, her freedom was bought with a large bribe and Irena continued her work with Zegota, the secret organization formed to help Jews in Poland. It can't be easy to write a book about the Holocaust for young readers, especially for some who are just beginning to learn about it. But Jennifer Roy has taken a real hero and used her to remind us that even in the darkest of times there are people who understand what the right thing to do is, who care and are willing to help others. Yet, Roy doesn't sugar-coat her story - when Irena tells parents the only guarantee she can give them about their children is that if they remain in the Warsaw Ghetto, they will die, or when people are forced to get into cattle cars, trains that are taking them to concentration camps and their death, young readers will easily grasp the magnitude and gravity of the Holocaust. While Roy's words tell about those dark times, Meg Owenson's realistic dark, foreboding mixed media illustrations support and extend the text, expressing the wide variety of emotions that must have been felt by everyone at that time. Be sure to read the Afterword and Author's Note at the back of the book. In addition, there is a glossary, an Index and Source Notes for further exploration. Jars of Hope is an inspiring picture book for older readers about one very brave woman and reminds us all that one person can make a big difference in the world. I've read about Irena online and now you make me want to read this. Am intrigued by the mention of her childhood. I do wonder where people get such amazing courage and drive to take such daring stands. Thanks, Alex! Hello Alex, the title of this book immediately caught my attention and after reading your review, I’m keen to read more about Irena Sendler. I would also like to know what happened to the children she helped. Thank you so much for the sweet comment left on my blog. I love your new look and your new name and am thrilled to think I might have played even a small part in it. You also mention how your life might have been different had your family stayed in the UK. 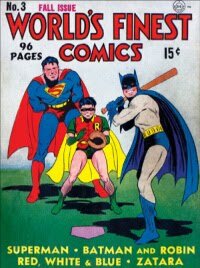 If you ever feel like writing about your childhood, I would be delighted to publish it on my blog with links back to your blog. In fact, I would be happy to post anything you might like to blog about!